I love this photo of the USS John C. Stennis nuclear supercarrier. It looks like a tiny model thanks to the F-18's exhaust fumes, which distort the air above part of the deck and turns the image into a bit of a tilt-shift photo. Tilt-shift photography works by applying selective focus to an image, either by tilting the lenses or using a digital filter. The fuzziness of some parts of the image fools our brain, making us focus on other parts and giving the illusion of a miniature. In this case, the tilt-shiftish effect is caused by the exhaust fumes of the F-18 taking off, making the ship, crew and airplanes look like a model. 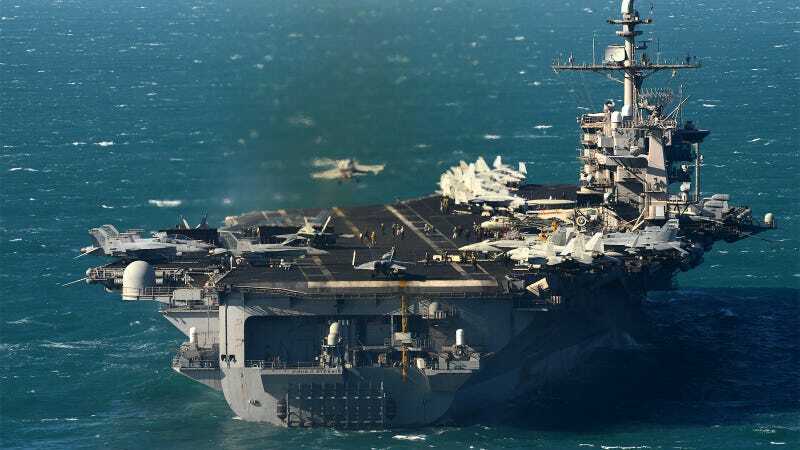 However, it is the Stennis, the seventh of the United States Navy's Nimitz-class nuclear supercarriers, which are still the largest warships ever built at 1,092 feet (333 meters) long and a displacement of 100,000 long tons. She is now serving on the US 5th Fleet area of responsibility, under the Operation Enduring Freedom.